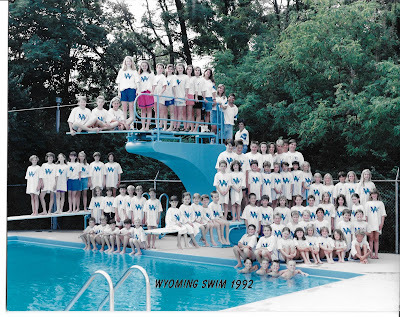 Sixty years ago, the Wyoming Swim Club celebrated its inaugural year. The concept, as we know it, was born at the Junior Women’s Club in the mid-1950’s. Soon thereafter, a committee was formed, enlisting 175 charter families each fronting $300 per family to be part of one the few pools city-wide. 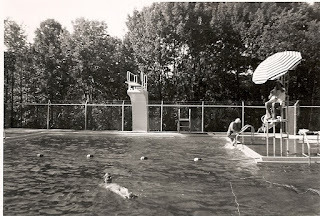 In 1958, the newly constructed the “Patterson” pool, state of the art at the time, opened to these families that not only donated financially, but with countless hours of physical work. The Wyoming Swim Club Swordfish Swim and Dive Team in 1992 – they still pose by the diving well, but the high board no longer exists. Over the years, membership nearly doubled, as a result, many more improvements, monetarily and voluntary hard work, were completed to make the pool a friendly and warm place to spend the summer. In the 1990’s, a member driven capital campaign raised $100,000 to upgrade equipment and improve the bathhouse. 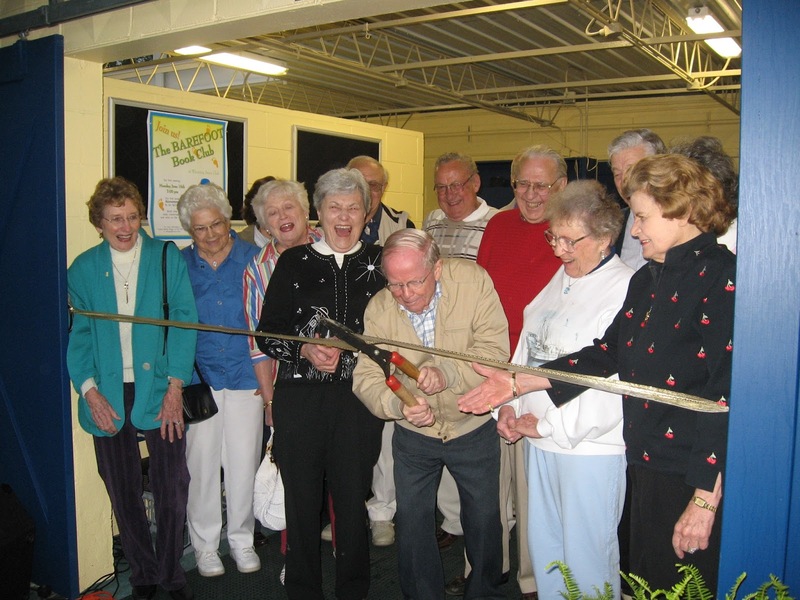 Once Jerry Scheele, who managed the club for 28 years, retired after the 1997 summer, the pool began its contract with the Powel Crosley, Jr. YMCA. Until this point, there were only three managers since the Club’s inception. Under the Wyoming Swim Club Board’s direction, the pool remains under YMCA’s Operating Agreement in conjunction with the members. By 2006, it was clear the pool was deteriorating significantly. 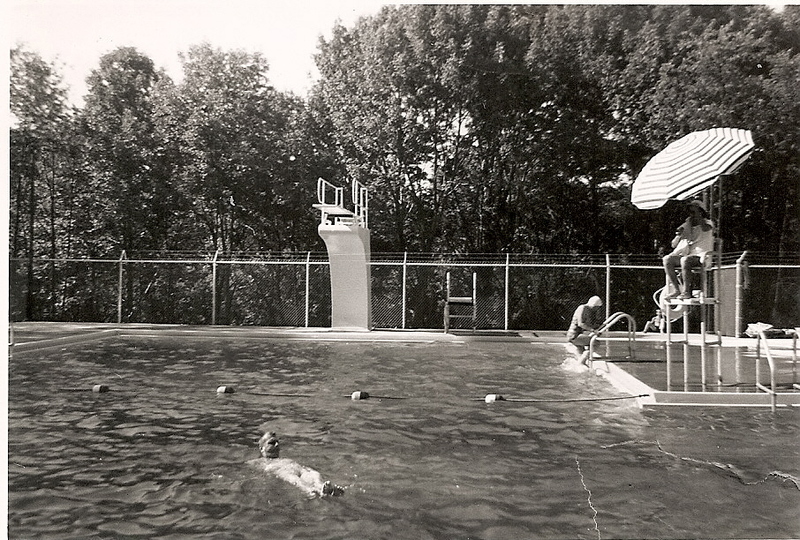 Two years later, the Board proposed to the membership an estimate of $135,000 needed to renovate the pool. Their vision was to build on the club’s strengths, the great location on 5.5 wooded acres, and a tremendous community of close-knit families who love their club. Memorial Day weekend of 2008, “Wyoming’s Backyard Getaway” opened with new shaded areas, a modernized pool with state of the art gutters, a bright, renovated bathhouse, and a new, easily accessible entrance. New social and aquatic programs were established, high-speed internet access installed, and of course they reopened Sharky’s Snack Bar. The member-driven club continues to grow and evolve, keeping the spirit of the founders and charter families; it is their pool! The aquatic programs, including week long swim camps, weekly activities, and swim lessons, have continued to be a favorite among the younger children. For those interested in swimming and diving with friends, the Wyoming Swim Club is the proud home of the Swordfish Swim and Dive Team. The basketball court, tether ball, ping pong, and other games keep everyone entertained outside the pool. The deck and the grills are always a great gathering place to eat and laugh with family and friends. Countless birthday parties, anniversary celebrations, and sports team parties have been held on the deck available to members for private rentals. Food Truck Fridays have given many an excuse to relax poolside after a long week with friends, free of cooking, all while letting the kids burn off some energy. From the kick-off weekend festivities through Labor Day, whether it’s a social party, a private party, swim lessons, camps, or just hanging by the pool, there is something for everyone. #1) what do I write? #2) what do I write? #3) when will it be summer? Aside from the cold, dreary, and unpredictable winters in Cincinnati, I found that it was the memories and experiences that I have of summer that I love. Of course, the summer trips are great, no homework and packing lunches daily are great, but really what were our summers made of? The Pool! We joined the Swim Club right after we moved to Wyoming and coincidentally, the renovations in 2006, when my oldest was barely three years old. Since then, I cannot imagine or remember our summers without it. My three children learned to swim taking lessons while I went to “bootcamp” in the parking lot ran by another mom from the pool. I found friends to vent with and laugh with while my son continually splashed water in my face. There were countless naps and changed diapers in the pack n’ play that I stored in the lifeguard’s closet (okay I admit it!). They now ride their bikes to the Swim Club regardless of who is there, thank you social media. I know that they will always have something to do, a friend to hang out with. I know if they need an adult, they know someone. I know that the lifeguards know their name and vice versa. I know when I walk in, I will always find a friendly face. I know a majority of the people and they know my kids, I know that everyone is looking out for each other and their children. I know that I can always find a chair, I know that I can hide and read by myself, or I can go socialize. I know that I can bribe my kids and make sure chores get done so they have money on their snack card. I know that half my towels and water bottles will be lost, but they will all be in the lost and found. I know that tents will be made with my dry towels and chairs around me. I know that underneath those towels will be precious faces that are all part of our memories. 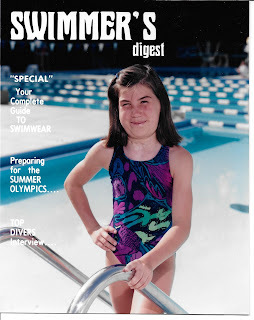 I know that I might not be able to write an article, but I do know that I can’t wait for summer and the Swim Club. Sizzle, hiss, pop! Laughter, Splash! Garbled talk of this and that in the background. Cool droplets of condescension touch my hand from a refreshing iced drink. The mouthwatering aroma of steak and hamburgers starts wafting over to my seat. I look around, and I’m in one of my favorite places of the summer, the deck of the Wyoming Swim Club, surrounded by my ‘summer’ family as well as my real family. When I grow tired of the cold, I sit back and think of those evenings with family and friends at the pool. That is my Happy Place. Excited for the controlled chaos of the dive and swim meets. And as always anxiously awaiting the premiere of infamous End of the Season Slide Show. I don’t have one memory but many of each summer of being a Swordfish Family. 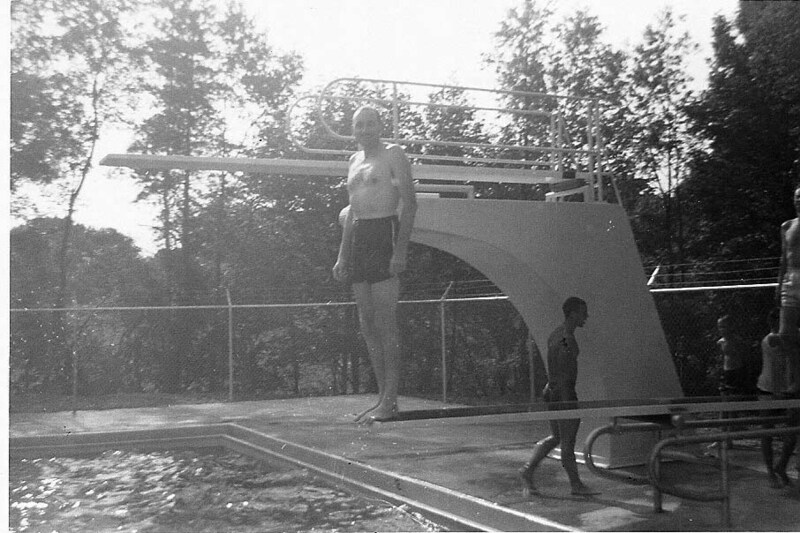 This 1959 photo of Bill Sheffield was taken during the Wyoming Swim Club’s second summer in operation. 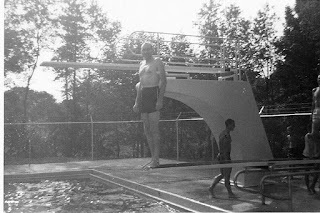 Wyoming’s Ken Barn floated in the brand-new Wyoming Swim Club pool in 1959. 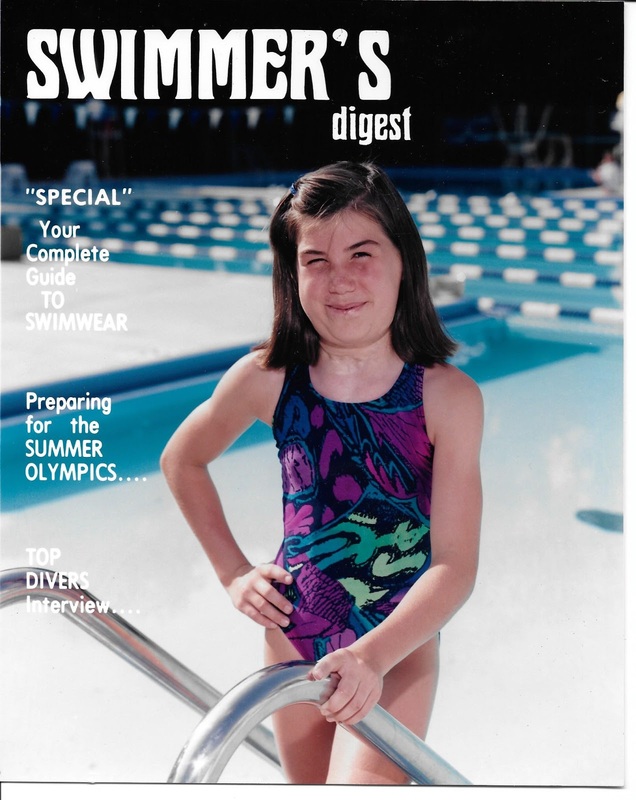 Emily Shuler, grew up in Wyoming and loved her summers at Wyoming Swim Club. As soon as Emily moved her family to Wyoming, they once again joined the Club, and now Emily is a member of the Wyoming Swim Club Board. In 2008, the Wyoming Swim Club celebrated it’s 50th anniversary by inviting the charter members of the Club to a ribbon cutting ceremony. 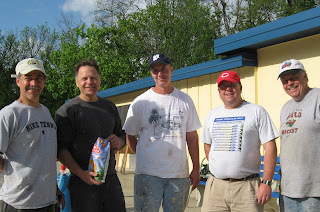 The 2007-2008 season will filled with a member driven remodeling that brought updates to the pool house, new pool gutters, and new shaded seating areas to the pool deck – these hard working men were integral to the success of the “new” Club. Left to right, Pete Tvitse, Fred Warmbier, Jim Murphy, Mike Leonard, and Ted Burgess. 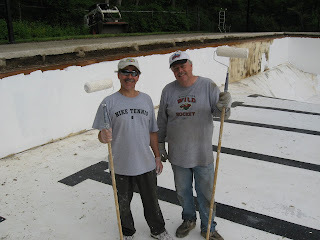 Pete Tvitse and Ted Burgess painting the pool in 2008 while the new gutters were being installed.